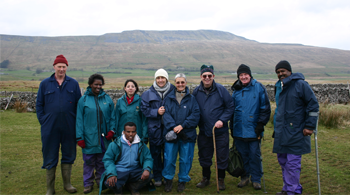 People & the DALES is a pioneering project launched by YDMT in 2009 to give disadvantaged groups of people the opportunity to visit the Yorkshire Dales countryside. People take part in activities, enjoy the magnificent landscape and learn new skills. All this whilst improving their physical health and well-being – what a fantastic opportunity! People & the DALES also aims to enthuse and inspire people to return to the Dales under their own steam – just what this website is all about. Who has benefitted from People & the DALES? Black, Asian and minority ethnic (BAME) communities. What activities have people done through People & the DALES? Groups take part in a range of fun, active and thought provoking activities that are tailor made to the people in the group. Some people might do a short walk to Malham Cove, whilst others climb one of the Yorkshire Dales 3 Peaks. Some people help rebuild stretches of dry-stone wall while others learn how to make and fly a kite. Walks of varying lengths often with a particular focus such as wildflowers, history, or archaeology. Conservation and practical tasks such as dry stone walling, hill sheep farming, path laying, woodland management, tree planting, horticulture, and willow weaving. Visits to specific sites such as farms, quarries, historical or archaeological features. Arts and crafts such as kite making and flying, painting and felt making. The project has also explored new ways of sustaining people’s links with the Yorkshire Dales through visits linking people from urban areas with people from the Yorkshire Dales. We also provide training for key members of community groups in organising and running their own visits. Contact us to talk with us about the training we can provide for your group. What difference has People & the DALES made? As well as giving people a great day out the project has had a positive impact on the people taking part. And above all enjoyed the beauty and tranquillity the Yorkshire Dales has to offer. Many of our groups have come back to enjoy it for themselves and even more have discovered green-spaces on their doorstep to enjoy. See our case studies to see the impact our work has had on some of the different groups we work with. 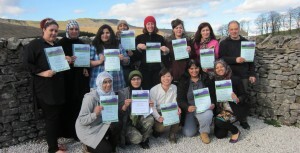 People and the DALES was funded initially through a grant from the Access to Nature scheme (2009-2013) part of the Big Lottery Fund’s Changing Spaces programme. This website was created thanks to this support. People and the DALES is now an ongoing part of YDMT’s work funded through money received from charitable trusts and our own ongoing fundraising.